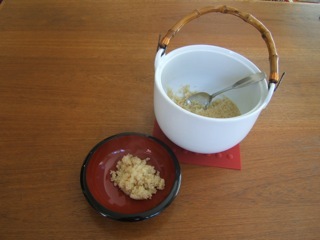 Quinoa made in Helen Chen’s Asian Kitchen Perfect Rice Cooker. This salad also contains edamame, kernel corn, black beans, red bell pepper, Vidalia onion and chives. Made of high-fired white porcelain, the Perfect Rice Cooker is the ideal vessel for cooking not only all varieties of rice (jasmine, sushi, brown rice and even sweet rice) but it also cooks other grains such as barley and quinoa (pronounced keen-wah), the ancient grain from the Andean region of South America. (Recipes to make both are included with the Perfect Rice Cooker.) 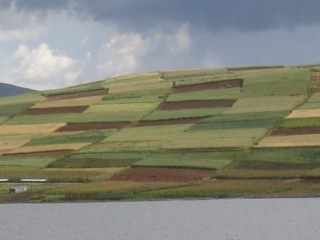 Helen recently returned from Peru and the area around Cusco, the ancient capital of the Inca empire where quinoa is a major crop. This gluten-free grain is enjoyed for its mild nutty taste and valued for its high nutritional value. It’s an excellent source of complete protein, containing all eight amino acids, making it a perfect substitute for meat. Cooked quinoa is very versatile and can be mixed with vegetables and seasonings, made into delicious salads or added to enrich soups. It’s so easy and foolproof to cook quinoa in the Perfect Rice Cooker. 1. Wash and rinse the quinoa thoroughly in cold water and drain in a fine meshed colander or strainer. 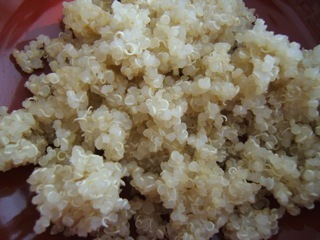 This is to remove quinoa’s natural coating of saponins which can lead to a soapy or bitter taste. 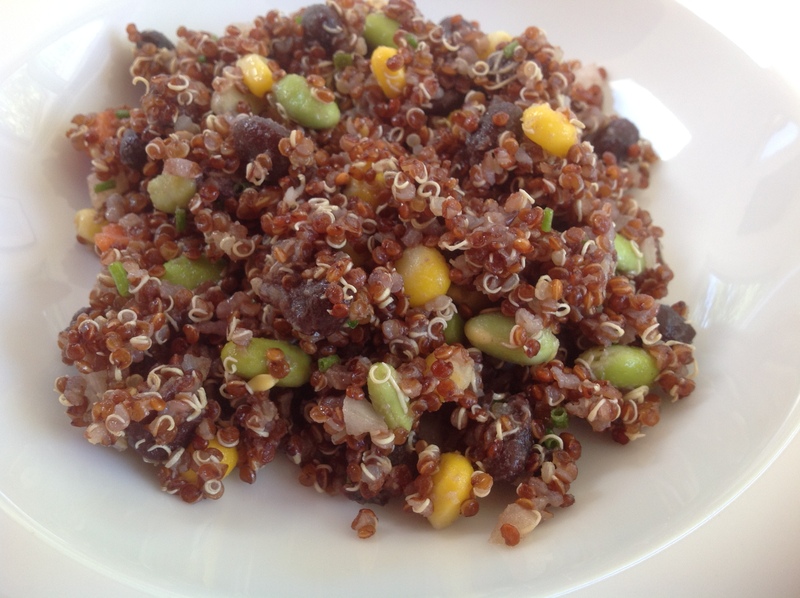 Transfer the quinoa to the bowl of the rice cooker and add water. Be sure all the grains are submerged. 2. Place the uncovered rice cooker in a stock pot with enough water to reach about 2 inches up the side of the rice cooker. 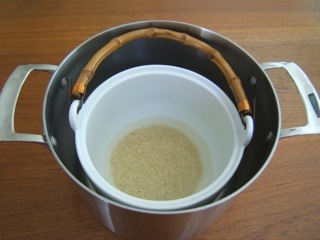 Lower the bamboo handle so it’s level with the rim of the rice cooker. Cover the stock pot and bring the water to a boil. When the water is boiling, reduce the heat to maintain a slow boil and steam for about 20 minutes or until the quinoa is tender and white spiral-like threads appear around each grain. Turn off the heat and let it rest for about 5 minutes before serving. Fluff with a rice paddle or fork and serve hot or cold in your favorite recipe. HIC, Harold Import Co. is proud to call Helen Chen a partner in Helen Chen’s Asian Kitchen® made by HIC Harold Import Co.
Helen Chen is a leading Asian culinary expert, cookbook author, cooking instructor and developer of Helen Chen’s Asian Kitchen® cookware and cooking supplies. Helen learned to cook from her mother and has combined the comfort of home-style dishes with an updated incorporation of heart-healthy oils and readily available supermarket ingredients—making cooking great Asian food easier for everyone. Helen Chen’s unique line of Asian cooking supplies was developed through many years of culinary experience and provides the kind of high-quality standards that you can expect from HIC, Harold Import Co. Some of the products available in the Helen Chen’s Asian Kitchen®innovative line of Asian cooking utensils include steaming accessories, cutlery, cookware, tea & sake, tabletop, utensils and housewares. 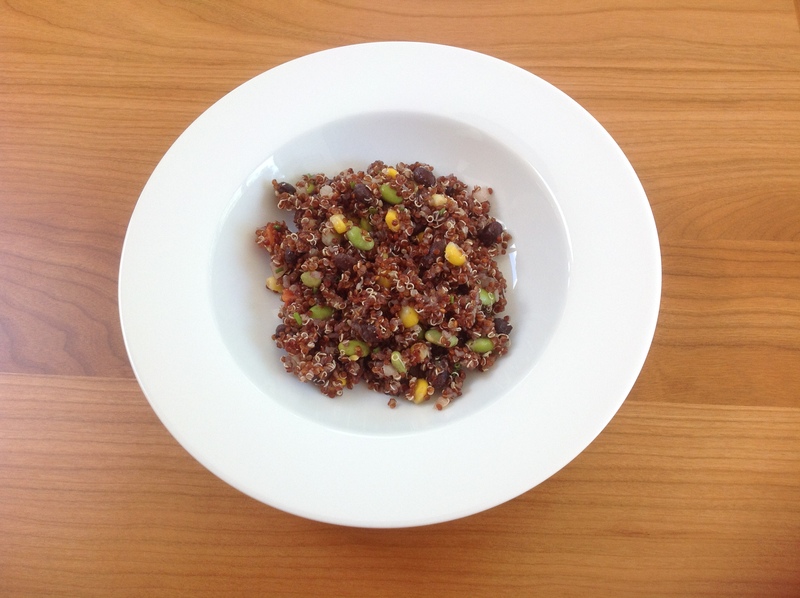 This entry was posted in Cook - Recipes from Friends and tagged ancient grains, Helen Chen's Asian Cooking Tools, Helen Chen's Asian Recipes, quinoa, rice cooker on August 21, 2014 by HIC, Harold Import Co.. The Egyptians buried them with the Pharaohs, The Greek used them to fortify athletes for the Olympic Games, and the world has been eating them raw, broiled, caramelized and deep-fried for more than 5,000. The onion, is probably one of the most versatile vegetable. They come in yellow, red, and white varieties, small or large. Generally, onions are peeled by hand and knife. It is a simple task, but a task that can cause a bit of frustration — and tears. There are many anecdotes to crying, and ways to make it easier. How to articles and videos abound, espousing the best method to cut through those outside layers, suggesting to first place the onion in the fridge, in ice water, or even boiling water before peeling with a very sharp knife to minimize the damage to the skin, (and cut down on the release of all those tear-inducing enzymes). Its razor sharp edges, skim away the layers of skin, leaving a perfectly skinned onion that is ready to be chopped, diced and prepared for use in everything from French onion soup, to a sweet onion potato salad or raw onions for a burger. Perfect for use with a variety of sized onions, the handy onion peeler is easy to use. Place the onion on the holder, with the root side down. Press down the central part of the tool until it comes in contact with the onion and check to see the knives are centrally located. Press down over the onion. Then, press the upper part slowly onto the oven for the final removal of the skin. Be careful, as the blades are very sharp! For a little inspiration, here is a Classic Onion Soup Recipe that will make you want to book your flight to France. In fact, I think I originally found it in an old Jacques Pepin cookbook. In a large soup pot over medium-high heat, heat the butter and corn oil until hot but not smoking. Add the sliced onions and sauté, stirring frequently, for 10 to 12 minutes until they are nicely browned. When the onions are browned, add the chicken stock and garlic. Bring to a boil and cook, uncovered, at a gentle boil for 20 minutes. Remove from heat. Using a food mill, push the soup mixture through it into a large bowl or pan. Add salt and pepper to taste. NOTE: At this point, the soup can be cooled to room temperature and refrigerated in an airtight container up to 2 days. To use, return to simmer before finishing soup with bread and cheese. 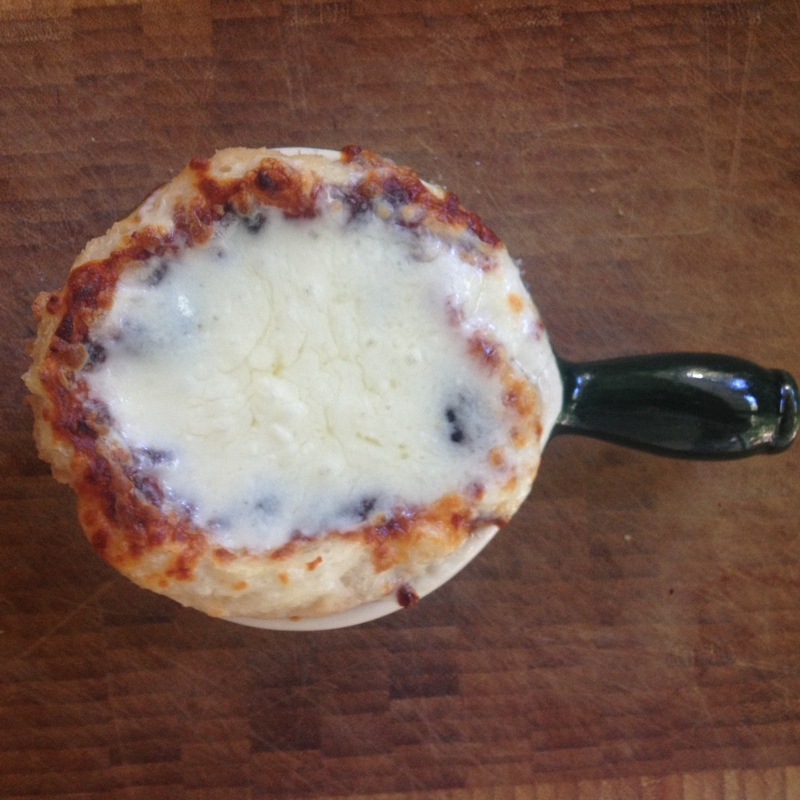 Tip: For an onion soup not to collapse, the soup bowl has to be filled to the rim with the onion soup and the bread. The cheese layer should cover the whole surface, so it will stick to the sides and form a crust that holds its shape and doesn’t sink. For a variation on this traditional recipe, Christina of Sweet Pea’s Kitchen shares her favorite French Onion Soup Recipe. 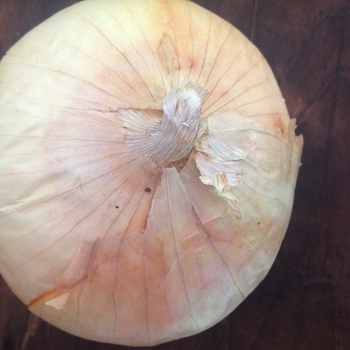 This entry was posted in Useful Tools and tagged alligator onion peeler, French Onion Soup, Laura Everage, onions, Tools Exclusively from HIC Harold Import Co., Vegetable tools on August 2, 2014 by Laura Everage.